WRENTHAM, Mass. – Making his first appearance of the season on Friday afternoon at King Philip High School, North Attleboro junior Matt Wanless didn’t appear to be the least bit nervous. Wanless, a junior, threw a complete game, scattering hits, leading his North Attleboro baseball team to a 5-1 win over King Philip. 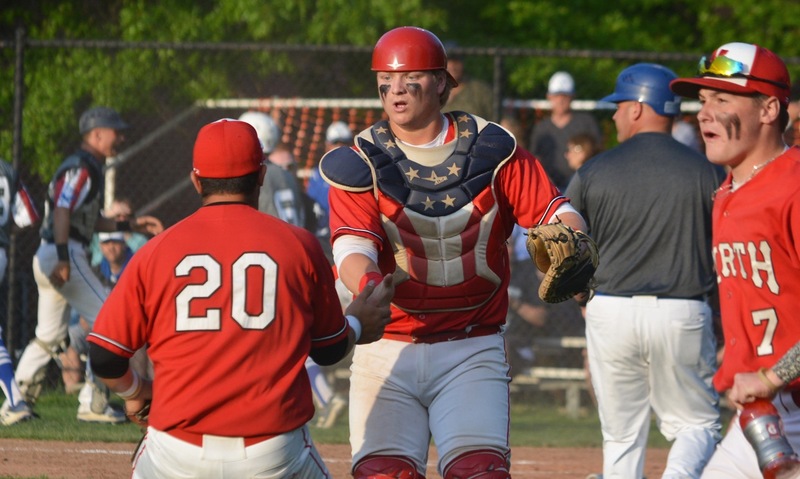 “He was in command of all his pitches, he felt really good about all of them, I think it was a lot of confidence, he got himself in a couple jams but I think he had a lot of confidence in his fielders and in his ability to pitch,” said North Attleboro head coach Mike Hart about Wanless. 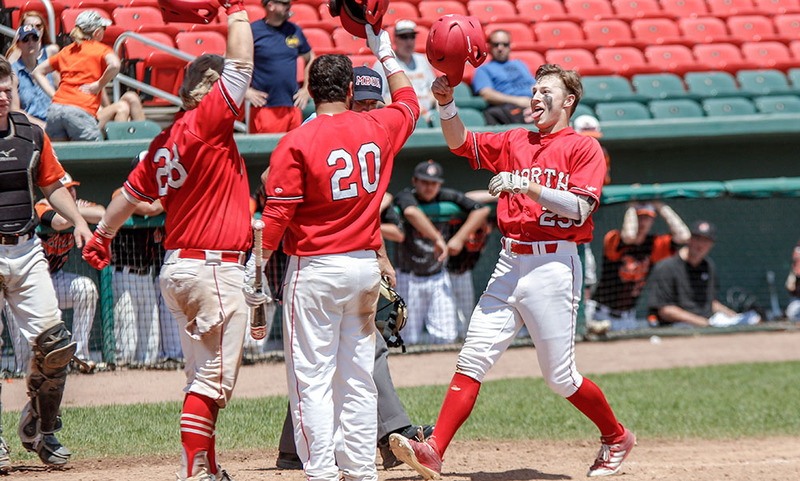 North Attleboro was able to give Wanless some run support right from the get go, as after Nick Sinacola (1-for-3, two runs, RBI) was hit by a pitch, he advanced to second on a groundout. and then was singled home by Zach DeMattio (1-for-3, two RBI). In the bottom half of the inning, Wanless allowed a leadoff single to Robbie Jarest, and after getting Tim Nault to fly out, he hit Pat Limerick with a pitch. After a Jeremy Rhines groundout, KP threatened with runners on first and third, but a flyout ended the inning for the Warriors. Wanless worked out of another jam in the bottom of the second, as with two outs, Jackson Shiebler and Ian Zimmerman hit back-to-back singles before Jarest drew a walk, but Wanless forced a fly ball to end the inning and preserve the 1-0 North Attleboro lead. 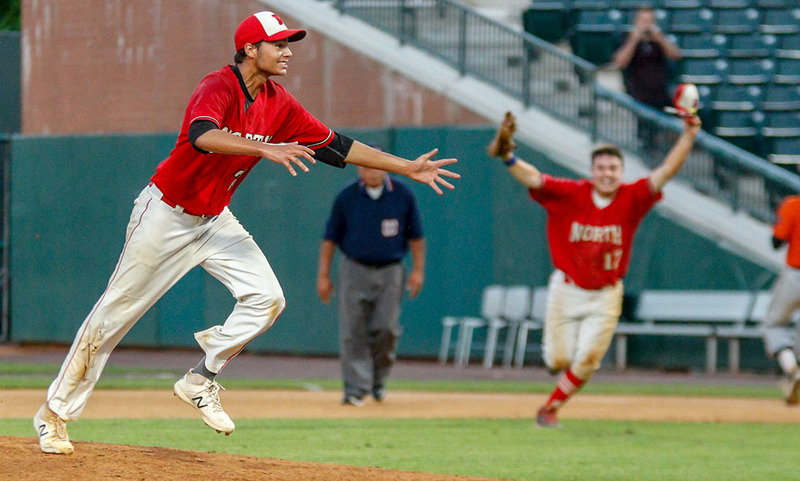 North Attleboro went back to work in the top of the third, showing off their patience at the plate as Kyle Bolger (1-for-2, triple, walk, run) and Ryan Warren drew back-to-back walks to open up the inning. Sinacola then delivered an RBI single to score Bolger, and Jeff Gale was hit by a pitch to load the bases. DeMattio then got hit on the elbow, which brought in Warren. After a popup, Brendan McHugh walked which brought home Sinacola, and Nick Raneri followed that up with an RBI groundout to plate the fifth North Attleboro run and fourth of the third inning. In the top of the fourth, North threatened again, as Bolger hit a rocket over the left fielder’s head for a leadoff triple, but Jarest was able to retire the next three hitters. In the bottom of the fifth, King Phillip pushed their only run of the game across, as Tim Nault walked, Limerick got by a pitch, and a single by Rhines scored Nault from second and left KP with runners on first and second with one out. Wanless was able to work out of it again though, as he struck out the next two KP batters to get out of the inning. With the win, North Attleboro improves to 7-1 on the year. They’ll head to Canton on Monday to face off with the Bulldogs. “We’ve had great senior leadership, and that’s carried over to our juniors, we’ve got a couple juniors that are really contributing,” Hart said about North’s hot start to the year. King Philip (4-5) will look to rebound on Monday in Attleboro against the Bombadiers. STOUGHTON, Mass. 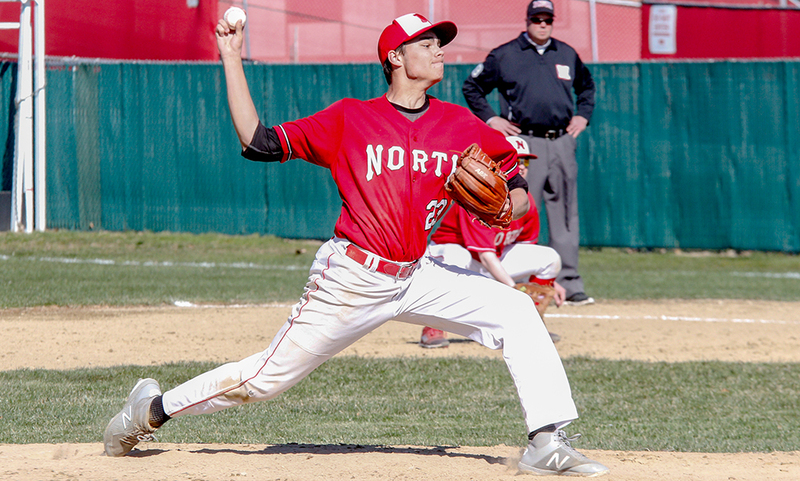 – North Attleboro senior Nick Sinacola was at his best on Monday afternoon, striking out 10 batters and firing his second career no-hitter in a 12-0 win over Stoughton. Sinacola tossed a no-no last year against Canton in a team in which North’s offense had to provide a late run to earn the win. There was no shortage of offense from the Rocketeers this time around, plating runs in every inning but the sixth. The Rocketeers came out swinging, scoring three runs on four hits in the top of the first inning, all before Sinacola (7 IP, 0 H, 0 BB, 10 K) even took the mound. Sinacola (2-for-4, RBI) helped his own cause with a leadoff single, Jeff Gale (2-for-5, three runs) doubled, and Zach DeMattio (5-for-5, three RBI, three runs) brought the first run in with a single. Nate Pearce (1-for-1) added to the lead with a two-run double to give Big Red a 3-0 advantage after just half an inning. “Getting those runs early gives me a lot of confidence, I feel like I have freedom on the mound and I just have to hit my spots,” Sinacola said. In the second, junior Ryan Warren (1-for-3, run) led off with a single and Gale reached on an error. DeMattio made it 4-0 with a double and Gale crossed home when Kyle Bolger reached into a fielder’s choice. Big Red’s offense continued to have success in the top of the third inning, pushing across two more runs. Brendan McHugh started things with a leadoff single and came home when Nick Raneri found the gap in right center field for an RBI triple. Sinacola again helped his cause, this time with an RBI single to make it 7-0. Sinacola was terrific in the bottom of the third, striking out the side – two swinging, one looking – on just 10 pitches. Aidan Harding (1-for-3, run) was responsible for tacking on another Big Red run in the top of the fourth. After a leadoff single, he took second on a wild pitch, advanced to third on a fielder’s choice and then scored on a sacrifice fly from Raneri. Stoughton got its first base runner of the game in the bottom of the fourth when Robbie Seaman reached on an error but Sinacola needed just four pitches to get the next two outs. The Rocketeers tacked on three more runs in the top of the fifth inning. Sinacola drew a one-out walk, took second on a single from Gale and scored on DeMattio’s RBI base hit. Bolger was hit by a pitch to load the bases and Harding and McHugh drew back-to-back walks to make it 11-0. Sinacola got into trouble for the first time in the top of the sixth inning. After getting the first out via strikeout, Sinacola fell behind 3-0 on Stoughton star Ruben Gonzalez — the first time Sinacola hit that count all day. Matt Seavey added an RBI single in the top of the seventh to make it 12-0. Stoughton nearly broke up the no-hitter in the bottom of the seventh when sophomore James Genest hit a hard grounder to short. Ryan Pasquel, another defensive sub for the Rocketeers, made a diving play and fired to first in time. However, the ball was dropped at first resulting in an error but keeping the no-hitter alive. Again, Sinacola needed just four more pitches to get the final two outs and complete the game. North Attleboro baseball (4-0 Hockomock, 5-0 overall) is scheduled to return to action on Wednesday when it hosts Milford. Stoughton (2-3, 2-4) will try to bounce back when it hosts Sharon on Wednesday.